How Does Pinterest Make Money and Are Business Models Really All That? This post originally appeared on the Econsultancy digital marketing blog, where there is an active discussion of Pinterest’s Business Model. The third and final part of our series on Pinterest brings us to the making-money part of the story. Twitter looks like a viable social media titan, but does anyone think they’ve cracked the code on their revenue model? And with just over 20 staff, and 10 million users – with brands now running campaigns on Pinterest, there’s a difference between “not having” a model, and waiting to select the right business model. We’ve talked about what Pinterest is and why anyone should care, and the amazing copyright judo that’s taking place to make the site possible. So it’s come to this: the making-money part, which is what separates a “cool feature” from a business. By Pinterest’s own admission they aren’t quite there yet on their business model. But Are Business Models All That? 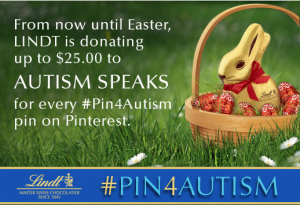 Take a look at Lindt Chocolate’s Pin4Autism campaign. It’s solid cause marketing in the service of building brand and list power on Pinterest. Last week Elliot Ross posted a great case study of how Toys R Us is driving pinning right from promotional emails. Does this mean Pinterest has a business model? Not quite. But it’s substantiation that real marketing elements are in play. And let’s face it, building a 21 million member network in two years is a pretty good qualifier of demand. Pinterest is currently a 22-person company with a prized demographic, amazing time-on-site measures, a high growth curve, hype among investors, and a better photo interface than Facebook. Waiting to Pick Their Shot? So, could you build a good business based on Pinterest’s set of givens. Sure, there are copyright issues which have been finessed. Just as Google Adwords did on Adsense. And yes, there is irrational hype. But as many of you pointed in earlier comments, there’s a lot of reality to Pinterest. Perhaps there’s s a difference between not having a business model, and waiting to build the right one. Isn’t that what early stage funding is for? There’s a discussion over at Quora on all the ways Pinterest could grow revenue. a) Charging advertisers through branded campaigns, outbound links and traditional ads. I expect there’ll be a raft of “me-too” media sharing networks. (I’m pitching ideas for them already.) This is a great model, expect new competitors. The next revolution will be image-based. Just as mobile has driven home the understanding that interactive experiences are way beyond hyperlinks, so is Pinterest a wake-up call that content really is no longer just text on a screen. I really don’t know if Pinterest will be the next great social network or not. Nobody does. But I sure believe the next big winner will help people wield rich media and graphics. That makes the future more like Pinterest than perhaps anything else. Kittens & Pinterest: Does Your Marketng Have Minimum Viable Personality? What Is Pinterest, and Why Should Anyone Care?